This conservation resource was created by Stephanie Pawluk, Hannah Sachs, and Sonia Stewart. It is shared under a CC-BY 4.0 International License. Wells Gray Provincial Park is located in central-eastern British Columbia and is part of the southern mountain caribou’s habitat. The southern mountain caribou herd populations have declined drastically since the introduction of logging outside the southern end of Wells Gray Provincial Park by Canfor . Deforestation has caused a change from old-growth forest to young forest which attracts moose populations which in turn enables a larger wolf population. This has increased the predation of mountain caribou . 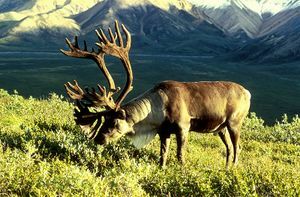 The loss of old-growth forests has diminished the abundance of lichen, the predominant food consumed by mountain caribou . Additionally, logging has increased stress levels in mountain caribou, which may affect their long-term ability to survive and reproduce . As a result, southern mountain caribou have undergone a drastic population decline from approximately 2500 caribou in 1995 to approximately 1540 caribou today and have lost approximately 60 percent of their historic range . One herd within the southern mountain population has been extirpated and others risk this fate . This population decline that has been occurring over the past 100 years has the southern mountain caribou listed as a threatened species under the federal Species at Risk Act . There has been significant public opposition to Canfor and to the BC Government’s allowance of logging right up to the park boundary . A controversial solution undertaken by the provincial government has included culling wolf populations, which has not proven to be successful . There are a range of additional potential solutions and forest management practices that have been proposed . It is absolutely imperative that action be taken to protect the southern mountain caribou as this species could be extirpated from Wells Gray Provincial Park and surrounding areas if current logging practices continue. The abundance of these animals is important as “the woodland caribou are an indicator of the health of our forests , and the decline of the caribou populations indicates a loss of balance within the entire ecosystem. Mountain caribou (Rangifer tarandus caribou), also known as woodland caribou, are a subspecies of Rangifer tarandus and are part of the deer family (Cervidae) alongside mule deer and elk. They are larger than mule deer and smaller than elk at approximately 1.0-1.2 meters in height, with males (bulls) weighing approximately 160-210 kg and females (cows) weighing approximately 110-150 kg. They have stocky bodies that are favourable for heat conservation and have long legs to trek through deep snow . Caribou are a type of ungulate, meaning they have large, concave cloven hooves which help support their weight in snowy conditions. Their thick fur coat varies from shades of brown to grey on the body with white fur around the neck. The southern mountain caribou is listed as threatened under the federal Species at Risk Act. 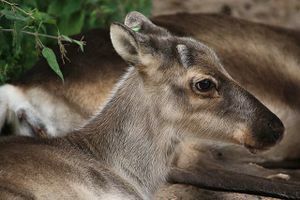 The southern mountain caribou is a unique population of Rangifer tarandus caribou and though they are genetically indistinct from other populations, they are considered a separate ecotype to other mountain caribou herds (ie. Northern Mountain Caribou) since they are considered one of the most southern caribou populations (shown on map). The range extends from central B.C. down to northern Idaho and Washington states . This area is known as the Interior Wet Belt, for its tendency to receive high levels of precipitation. This is one of the only remaining caribou groups to inhabit rough, mountainous ranges and to feed on arboreal lichens in winter. Their range receives a deeper snowpack compared to other ecotypes which force them to migrate south to regions with less snowfall. When the snow makes traveling at higher elevations difficult, the caribou will migrate north to feed on lichen on the trees. The majority of their habitat consists of old growth forest which is required for sustained lichen growth and adequate cover from predators. In addition, deep levels of snows can force smaller deer species south, taking the predators with them. As previously mentioned during the winter caribou rely on lichen as their main source of food. Specifically, during the late winter, they rely heavily on two species: “horse hair” (Bryoria spp.) and “old man’s beard” (Alectoria sarmentosa), which are hair-like and grow in clumps on evergreen trees. This diet can provide enough calories to sustain the species until spring when they can feed on leafy greens that grow in damp areas such as broad-leaved herbs. They tend to avoid tough, fibrous woody scrubs, as they cannot digest this food source properly. In early winter, the tender parts of the green leafy plants are no longer available and the snowpack is not strong enough to enable caribou to reach the lichen growing on trees, so they must once again adapt and shift their ways of obtaining food. One solution is to travel long distances to find fallen trees where they can access the lichen with ease. Another option is to migrate to lower elevations where plants and scrubs have retained their leaves, such as Pachistima myrsinites, or more commonly known as “falsebox” scrub. Come late winter, the snow at higher elevations is frozen solid, making it possible to support the weight of the caribou to reach lichen growing on the coniferous trees. Mountain Caribou only mate in a very small window known as the rut, which occurs around the month of October. During this period the males (bulls), females (cows) and young (calves) all come together and a hierarchy is formed which is immediately broken up after the mating season. Bulls that are big, dominant, healthy and strong are more likely breed with the most females. Cows usually have to be older than 2 years to breed. The gestation period is slightly over seven and a half months, so birthing typically occurs in early July. The pregnant cows travel to rugged, isolated areas to avoid predators and tend to scatter themselves across the entire landscape before they give birth. Almost all cows give birth to single calves. Newborns spend time struggling to stand but will follow their mothers soon after they are born. Wolves are the dominant predator of the mountain caribou and are known to closely follow the migration patterns of caribou herds. Other predators include cougars, bears, wolverines, and lynx . Caribou avoid these predators by migrating to large patches of old-growth forest as opposed to residing in areas with young forests or grass clearings; however, human development and anthropogenic disturbances expanding further north each year contribute to the increased predation on caribou herds. Logging, mining, and gas and oil operations open up roads and corridors that fragment the mountain caribou habitat and allow for predators to pursue herds more easily . Canadian Forest Products Ltd. (Canfor) is a forest products company with facilities located across North America. Canfor operates a sawmill in Vavenby, BC, a small community thirty kilometers east of Clearwater, BC in the southern interior of British Columbia. Canfor also holds a forest tenure, Tree Farm License #18 (TFL18), in a defined forest area near Clearwater, BC . TFL18 encompasses 74 266 hectares and 90% of this area is considered productive forest . The harvesting boundaries of TFL18 directly border the southern portion of Wells Gray Provincial Park . The allowable annual cut (AAC) for TFL18 has fluctuated over the decades to account for various factors such as the expanding commercial use of lodgepole pine and to salvage pine affected by mountain pine beetle. The AAC started at 70 792 cubic meters in 1955 and, as of 2006, is currently set at 290 000 cubic meters . The Allowable Annual Cut Rationale for TFL18 acknowledges that 7300 hectares of Type 2 matrix range of the southern mountain population of Caribou extends into TFL 18 . Matrix range is defined as an area that is outside the designated seasonal range of the population and in which the predator density is 3 wolves per 1000 km²; it is still considered critical habitat . The AAC has not accounted for mountain caribou management but the company is has stated that it is willing to re-determine the AAC if the province establishes caribou range plans such that TFL 18 would be affected . Additionally, the Proposed Management Plan for TFL 18, produced by Canfor, references that the only wildlife habitat considered is the critical moose range, not the mountain caribou habitat. For comparison, the moose habitat covers approximately 2000 hectares of the area of TFL 18, roughly one third the size of the mountain caribou range within TFL 18 . Deforestation caused by logging alters the nature of the ecosystem and causes changes in species behavioral interactions. The behavioural interactions that occur as a response to logging in habitats such as Wells Gray Provincial Park and surrounding areas ultimately results in increased caribou predation. Deforestation changes the habitat from old-growth forest to young forest and alters habitat connectivity. Young forests that have been logged attract moose as they contain deciduous trees and shrubs that moose feed on. The increased moose population then attracts more wolves to the area, ultimately introducing a larger predator population than normal. Due to the habitat fragmentation and lack of old-growth forests for cover, mountain caribou face difficulties in protecting themselves against wolf predation. Further, the increased moose population intensifies resource competition with caribou. Ultimately, this interaction response of moose and wolves to deforestation negatively impacts the survival of caribou through increased predation and competition . In addition to increased competition and predation, the loss of old-growth forest limits access to a primary food source for the caribou. Caribou feed on lichen which is slow growing and only grows on trees in old growth forests. They rely on it particularly in the winter months when the snow pack makes it difficult to forage for other plants. Thus, the loss of old growth forests from logging means the loss of a staple food source in the caribou diet. Another reason why caribou prefer to inhabit old growth forests is because the snow pack does not get as deep in old growth forests on account of canopy interception of the snow. Having less snow on the ground better enables the caribou to reach lichen on the trees . Anderson et al. conducted a study of the physiological stress response of caribou to anthropogenic disturbance including roads, transmission lines, developments, logging, and burned areas. In order to quantitatively measure chronic physiological stress, cortisol levels were tested from caribou hair. Out of all of the models testing different anthropogenic stressors, the logging model was the most correlated with cortisol levels in caribou. The study finds that having a smaller range from anthropogenic processes and logging does increase cortisol levels in caribou, thus scientifically proving a potentially harmful physiological response caused by logging. However, the consequences of increased cortisol levels in caribou for long time survival and reproduction remains unproven and the authors call for further research to be conducted in order to guide effective caribou management strategies . As described, deforestation drastically alters the composition and interactions of the habitat, and as a result of logging, the southern mountain caribou population is declining drastically. In 2007, the Government of British Columbia released the “Mountain Caribou Recovery Implementation Plan” (MCRIP) with the ultimate goal of achieving the pre-1995 population levels of caribou in the existing range. This plan is primarily based on protecting the herds from logging and road building within their range as well as managing predator populations in order to promote recovery of the caribou . Although the MCRIP did not include the matrix range, the “Implementation Plan for Ongoing Management of South Peace Northern Caribou” founded in 2013 does recognize its importance to the maintenance of appropriate predator-prey proportions . In 2014, Environment Canada released a recovery strategy for the southern mountain caribou population that identifies the severe decline in population numbers primarily due to natural and human-caused habitat alteration. The document outlines the type 2 matrix range as critical habitat for the southern mountain caribou and identifies it as crucial to their recovery. Maps are also provided in the recovery strategy that directly identify the area around Clearwater and to the south of Wells Gray Park, where TFL 18 is located, as critical habitat . In February 2017, prior to the provincial election, then-Premier Christy Clark announced that the BC Liberal Provincial Government would be “investing $27 million on a comprehensive caribou recovery program” over three years . This money has primarily been invested in programs to reduce predation risk, such as wolf control, however there is no evidence that there has been funding to directly protect the southern mountain caribou habitat . Ultimately, both the federal and provincial governments have recognized the severe decline in the southern mountain caribou population and have produced various recovery strategies however the province continues to provide cutting permits for Canfor to harvest the area in TFL 18. Ultimately, the groups have expressed significant concern in regards to the failure of Canfor to uphold its commitments to the Guiding Principles, specifically in terms of the mountain caribou matrix range within the proposed cutblock area . The Upper Clearwater Referral Group has issued several letters asking for further efforts in the protection of the mountain caribou near Wells Gray Park. They have asked Premier John Horgan of the BC NDP to establish a moratorium on industrial-scale logging in the area that the caribou’s critical habitat, as designated by the Species at Risk Act, is not being adequately protected . They have also presented a plea, in conjunction with many other conservation groups and professionals, asking for an emergency order to halt harvesting operations in order to provide protection for the southern mountain caribou herd . Additionally, they issued a letter to Canfor highlighting their concerns regarding the logging . As previously mentioned, in 2014, the Canadian government put in place the "Recovery Strategy for the Woodland Caribou, Southern Mountain population (Rangifer tarandus caribou) in Canada" in an effort to stop the decline of the southern mountain caribou population (including all subpopulations). It identified that much of the habitat fragmentation that was ocurring was caused by human disturbances and provided some strategies for addressing those particular issues . However, within the following years, it was clear that wolf culling was the primary solution for the government to remediate the overall declining southern mountain caribou populations. The provincial government’s “action plan” had no impact the following year on stopping habitat destruction, as was promised. Clearcut logging and cutblocks continue to be approved by the government. Additionally, in 2014, the government released the "Management Plan for the Grey Wolf (Canis lupus in British Columbia" which outlined the steps to specifically control grey wolf (Canis lupus) populations, the primary predator of the southern mountain caribou. The wolf population has increased steadily with no indication of decline and has been designated as "Not at Risk" by the Committee on the Status of Endangered Wildlife. The government claims that their main focus is to reduce the amount of wolf predation on livestock in the area, by lifting bag limits and by providing low cost or free species hunting licenses for wolves in southern B.C in order to allow for the regrowth of caribou populations. Many news sources claim that this action plan resulted in 84 wolves being shot by government-sanctioned hunters in the first year (2015), 163 wolves in the second year, and recent reports claim that over 268 wolves in total have been killed in the past three years. Although these statistics are reported in the news, there is no evidence of official government reports on these numbers. This particular solution has gained substantial publicity; many Canadians, NGOs, and scientists are angered by the decision to cull wolves in order to increase caribou populations and claim that the government is using the wolves as a scapegoat to the real issue, which is land mismanagement by humans. Pacific Wild and Valhalla Wilderness Society have filed a petition through the Supreme Court to cease the permit for wolf hunts and have the government act accordingly to the Species At Risk Act  In 2016, the Government performed a formal review on all of the southern mountain caribou populations, including the Wells-Gray herd. All subpopulations were reported to still be on the decline after the wolf culls . In April 2017, an application for an emergency order to act in accordance to the Species At Risk Act was submitted to government officials by numerous NGOs, including Wells Grey Protection Society. Immediate action was called to stop further destruction of habitat that continued to occur after the 2014 management plan was formed. The order requested to halt road building and logging in the sensitive matrix range (habitat area where predators are affecting caribou populations). It is unclear whether any actions from the government resulted from this application. The logging that has occurred adjacent to Wells Gray Provincial Park has significantly contributed to the substantial decline in the Southern Mountain Caribou population, as stated by many action groups located in the area as well as recognized by both the federal and provincial governments . Numerous scientific documents, reviews, and letters have been submitted to the governments outlining the impact of logging on the predation and physical conditions of the caribou which has resulted in the species being identified as threatened under the Species at Risk Act . Although the issue has been recognized by the governments, no immediate action has been taken to halt industrial logging operations in the area. Instead, a wolf culling program has been implemented to decrease the predation that the caribou are facing and allow for population regrowth . There is no evidence that wolf culling has remediated the problem and, according to many NGOs and scientists, the most effective solution is to stop habitat destruction by not allowing logging in the area. Matrix range has been proven to be critical to the survival of Southern Mountain Caribou and is defined as a density of a maximum of three wolves per 1000 km². Since wolf culling has been ineffective, habitat destruction must stop in order to protect the remaining old-growth forest in which the caribou’s risk of predation is low . To effectively prevent further population decline, the Government of British Columbia must stop providing cutting permits to Canfor. As long as industrial-scale logging is present, wolf density will continue to increase and caribou populations to decrease . ↑ Logging-induced changes in habitat network connectivity shape behavioral interactions in the wolf- caribou- moose system. Ecological Society of America, 84(2), 265–285. ↑ 5.05.1 Anderson, W., Brannen, D., Dupont, D., Ewacha, M., Roth, J. (2017). Disturbance and Chronic Levels of Cortisol in Boreal Woodland Caribou. The Journal of Wildlife Management, 81(7), 1266-1275. ↑ Barriere, B. C., & Jan, B. C. (2013). Wells Gray Park caribou declining. North Thompson Journal, 1–3. ↑ Courtois, R., Ouellet, J.-P., Breton, L., Gingras, A., & Dussault, C. (2007). Effects of forest disturbance on density, space use, and mortality of woodland caribou. Ecoscience, 14(4), 491–498. ↑ 10.010.110.2 Environment Canada. (2012). Management Plan for the Northern Mountain Population of Woodland Caribou (Rangifer tarandus caribou) in Canada. Species at Risk Act Management Plan Series. Environment Canada, Ottawa. vii + 79 pp. ↑ 19.019.119.2 Environment Canada. (2014). Recovery Strategy for the Woodland Caribou, Southern Mountain population (Rangifer tarandus caribou) in Canada. Species at Risk Act Recovery Strategy Series. Ottawa: Environment Canada. ↑ B.C. Ministry of Forests, Lands and Natural Resources Operations. (2014). Management Plan for the Grey Wolf (Canis lupus) in British Columbia. Victoria: B.C. Ministry of Forests, Lands and Natural Resources Operations.